It’s sad when a TV show is forgotten through the mists of time because so many episodes are lost. Over the years, many TV series have been exported to the US in particular for the Public Television (PBS) market and have gone on to be quite popular. I think All Gas & Gaiters would have fallen into this category if so many episodes were not lost. It is true that the first two of five series were recorded in black & white but series such as Dad’s Army made its way over here to some success. Of course, I could never understand why people have such an aversion to black & white television, but that is another article. 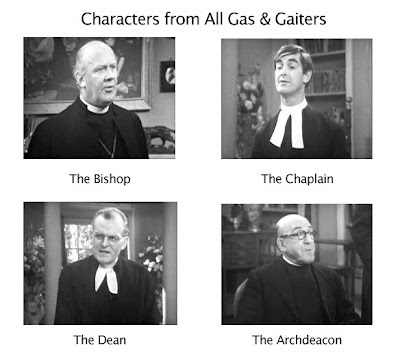 All Gas & Gaiters was a series that was conceived by husband and wife team Edwin Apps and Pauline Devaney. The two were both actors but decided to have a go at writing. The main reason for this is that they needed to stay at home waiting for calls for possible job opportunities; they might as well try their hand at writing. They had written a piece for television but they wanted to do more and try to do something in comedy. An idea presented itself from a dream Edwin had and this formed the premise to The Bishop Rides Again! They sent the script in to the BBC under the name of John Wraith since they were friends of Frank Muir who was the head of comedy at the BBC and didn’t want to create an awkward situation. Eventually, Muir talked to both of them and found out it was Edwin and Pauline who wrote the script. He loved it and commissioned it for an episode of Comedy Playhouse. Comedy Playhouse was a really interesting idea. Starting in 1961, it was a series of unrelated comedy episodes that would run every year. Some of the episodes would be so good they would go on to become series. Sometimes, the BBC would put shows in there they knew they wanted to become full time series but used Comedy Playhouse as a way to test the waters. 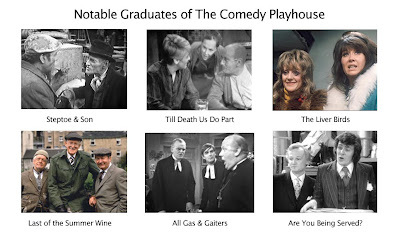 Some of the most notable series to come out of Comedy Playhouse and become a whole series would be: Steptoe and Son, Till Death Us Do Part, The Liver Birds, Are You Being Served?, Last of the Summer Wine, and of course All Gas & Gaiters. 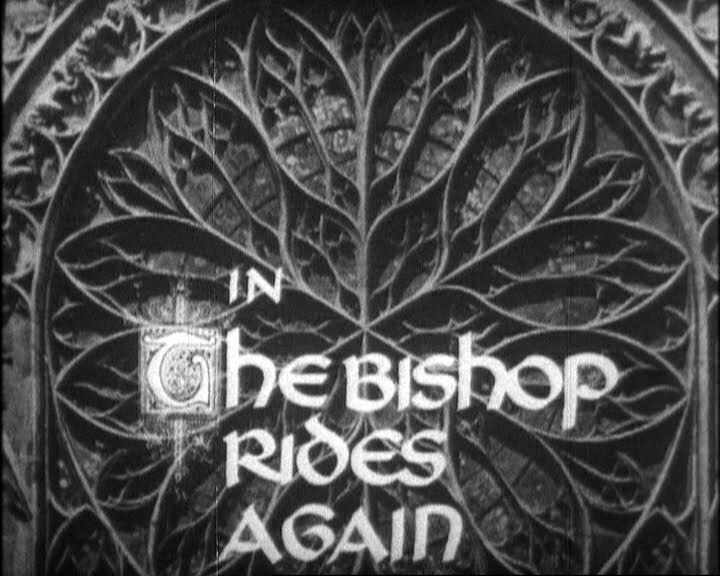 Of Course, by this stage, All Gas & Gaiters would air as its episode title, The Bishop Rides Again. Comedy Playhouse lasted for 15 series and ended in 1975. The pilot for Comedy Playhouse was situated around a clergy at the fictional church St. Oggs and how these people work together. 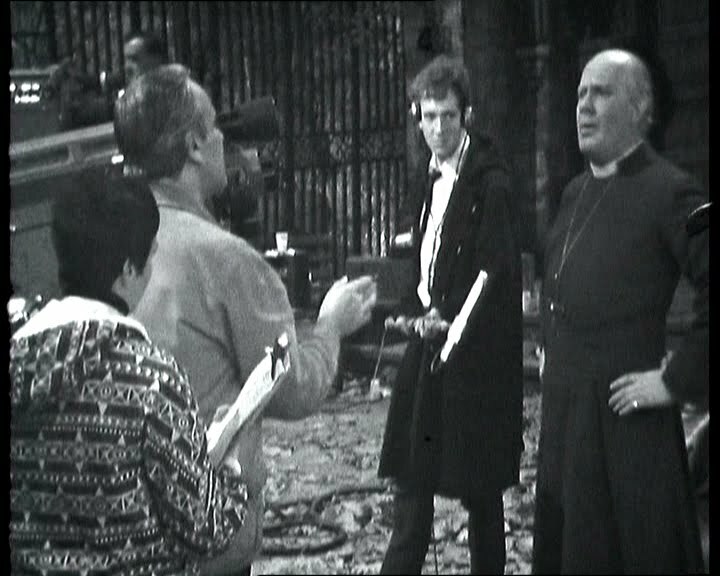 There was the Bishop played by William Mervyn, The Dean played by John Barron taking the part in a similar direction he takes a lot of the roles, as a bossy and often difficult person. 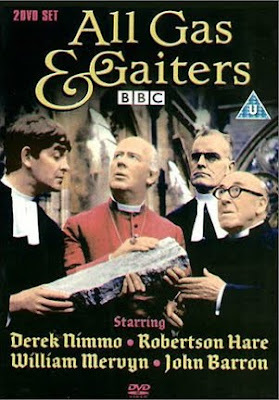 Robertson Hare plays the Archdeacon and Hare was 75 when he took the role and was an immediate success. 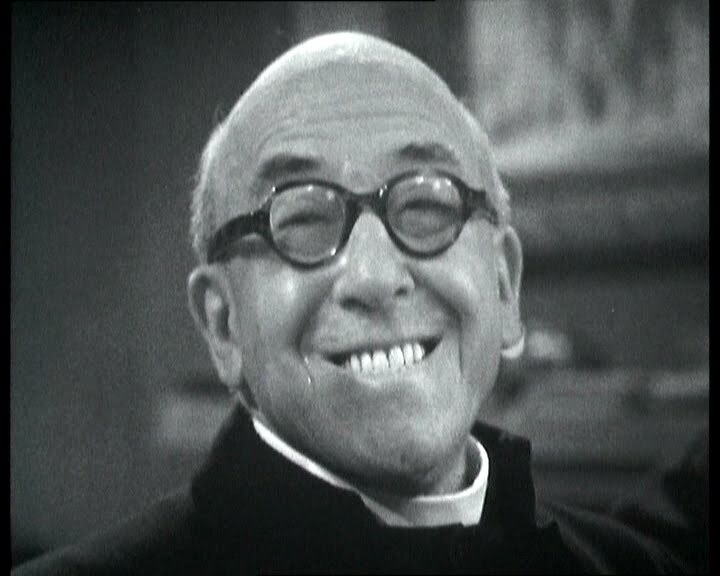 Finally, the Chaplain named Noote was played by Derek Nimmo. This part would turn Nimmo into a household name. 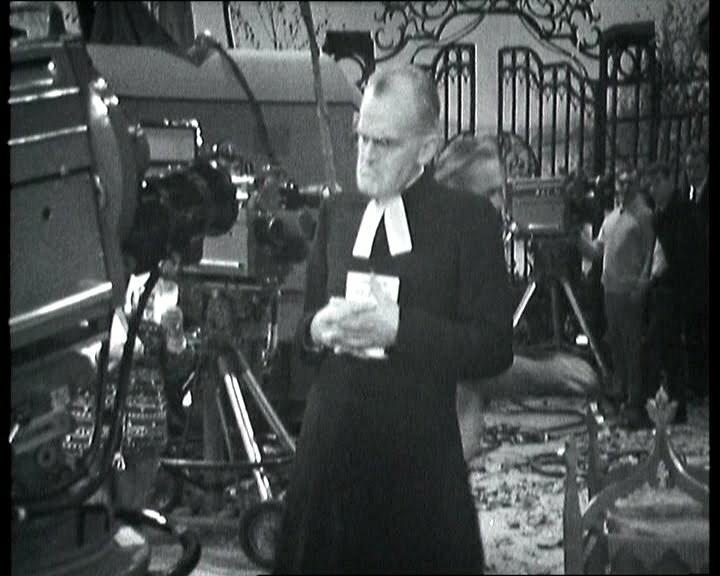 The episode revolves around a bequest of £60,000 to St. Oggs. In order for St. Oggs to get the money, the Bishop would need to re-enact the medieval custom of riding around on horseback dispensing forty pairs of stockings to forty virgins. In this case, there is no room for interpretation of the request. It needs to be forty virgins and they have one day to do it all the while with the Bishop travelling on horse. First they need to get forty pairs of stockings. The Bishop sends Noote to do this. Noote is required to go into a woman’s clothing shop to get them. 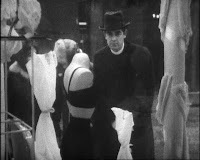 After he leaves, with a lot of strange looks from the shoppers, Noote bumps into a Police Officer and all of the stockings fall out into the street. The Police Officer takes Noote back to the Bishops house to confirm Noote is not some sort of pervert. After all that is figured out, The Bishop sets out on horse, Noote on foot and the Arch Deacon following along in a car to dispense the forty stockings. Things start off bad as it is raining but the rain is the least of anyone’s worries. Not only does the Bishop need to hand out the forty stockings but he needs to make sure they are virgins and has to figure out a way to be sure. This leads to a lot of innuendo and confusion. After working on it all day, they have only been able to give one pair away and that was only to an eleven year old girl which after they hand it off to her, they run. The Bishop thinks he has until midnight to give away all forty pairs but as he sits in the Archdeacon’s car trying to figure out what to do, the Dean bicycles by and informs the Bishop that he only has till sundown. It’s already after 3pm. Later, the Bishop goes home and realizes that not only had he failed to get rid of the stockings, he had failed to secure the money. Suddenly, Noote realizes that he made a mistake and that he had arranged for the Bishop to speak with young women who were in the convent. There were over forty of them. The Bishop is able to get rid of the stockings and secure the money. 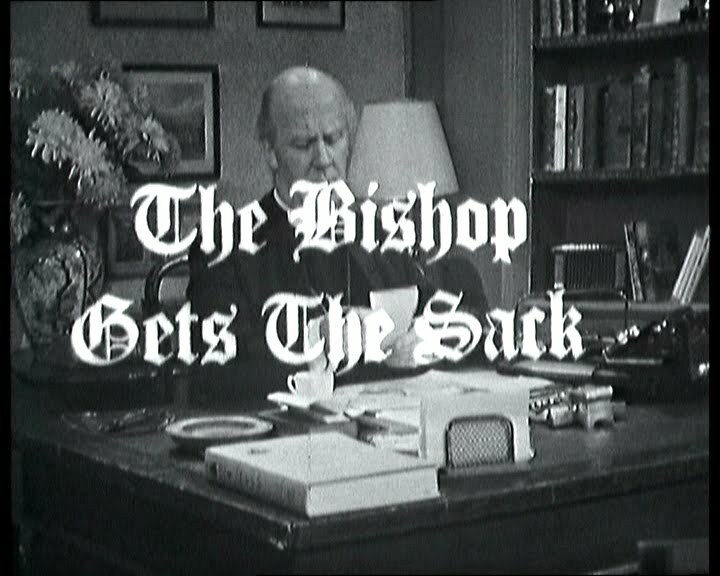 The Bishop gets a letter from a Producer at the BBC who wants to make a program about St. Oggs. The Bishop immediately sees this as a great opportunity to advertise St. Oggs with the hope of bringing more tourists to the area. The Bishop is responsible to find someone on his staff to host the program and knows that the Dean has impeccable knowledge of St. Oggs though the Bishop also know how boring the Dean can be and plans to not even tell him about the program. Just as he hatches this plan, the Dean calls him to let the Bishop know that he also received a letter from the BBC to do the same program and offers up his services to host the show. The Bishop informs him that he has already someone lined up….himself! The next day, the Bishop is at the steps of St. Oggs in front of BBC cameras trying to host the program. He is awful! He keeps speaking to the wrong camera and is generally boring. 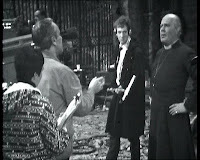 The Producer has a plan and has a private word with the Bishop. As he does so, Noote starts talking to a Production Assistant. The PA tells Noote that the Producer is going to sack the Bishop but Noote shouldn’t worry because the Producer is so smooth that the Bishop is not even going to know it is happening. Sure enough, the Bishop comes back and explains to Noote that he doesn’t feel, since he is such a busy man in a high position, should waste his time on hosting a TV program. Just then, the Dean turns up, finds out about the opening and takes a turn at being the presenter of the program. His style is much different than the Bishops. For starters, the Dean points out garbage cans as being the most important thing at St. Oggs and he talks about how he will fine people if he catches anyone not using it. Of course his expression, as only John Barron can do it, is severe and humourless which of course is extremely funny. Now, the Producer has to have a talk with the Dean to discuss how presenting a TV program is far beneath a man as busy as the Dean…. The Bishop and Noote decide the best person to do this is the Archdeacon but because the program needs to be recorded the next day, they make the Archdeacon practice all night! They make him practice so much so, he loses his voice. Just as the Bishop feels all is lost, he realizes the only person left to do it is Noote himself. To help Noote along, they give him a little dutch courage and suddenly he is a TV star! He is excellent hosting the program and everything works out. Just as we saw James Beck in The Bishop Rides Again, we see another Dad’s Army cast member in The Bishop Gets the Sack. 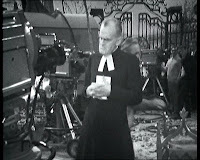 The Producer is played by John Le Mesurier aka Sgt. Wilson. I always enjoy everything I see him in. All Gas & Gaiters is pretty fun show. The jokes are a little predictable and the acting was a little stiff but we were also watching the first 2 episodes. This week, during my commutes, I have been listening to the existing radio episodes of the series. These were done in 1970 & 1971. They are very, very funny. It is clear that over the years since the series began, Edwin and Pauline’s writing style improved quite a bit. The pacing and the storylines were really quite enjoyable. 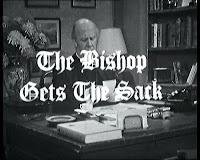 The Bishop Rides Again and The Bishop Gets The Sack are both quite funny but there isn’t much depth to the storylines and they are pure farce. Like most great series, it is not uncommon to start out funny but not hit its stride for another year or so. Too bad we will probably never see more episodes again. 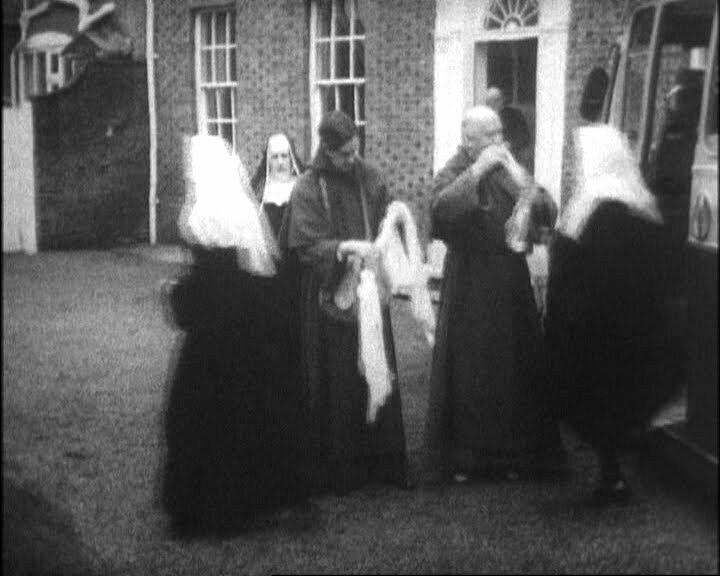 Out of the 33 episodes of this series only 11 episodes exist in the BBC archives. This includes 2 episodes from Series 1, 2 episodes from Series 4 and all of Series 5. Only the Comedy Playhouse Pilot was found in 2001. A quick clip of The Bishop Rides Again was featured on a documentary about missing episodes narrated by Terry Wogan called, Missing Believed Wiped. This documentary is really quite interesting, focusing on Dad’s Army, but gives us a really good background into the story of how and why episode went missing. If anyone is interested in it, it is on the Dad’s Army Series 1 & 2 DVD set. 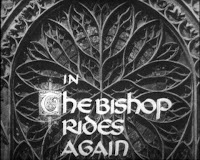 When I saw the clip from The Bishop Rides Again, it piqued my interest about the series. Just by chance a few years later, I was looking on Amazon and I realized the existing episodes were released on DVD. The DVD set is two discs. It is a really nice cover which is actually from one of the covers from the Radio Times. What is really interesting about the cover is that Radio Times cover was taken when John Barron had left the series and was replaced with Ernest Clark. Clark is actually on the Radio Times cover but when this DVD set was released, DD Video did a really good job of photoshoping Barron in Clark’s place. Barron eventually returned to the role in later series. The unaltered version is on the PAL VHS version of this release. There are also comprehensive Viewing Notes written by Andy Priestner. They are written by someone who truly enjoys the series and that makes the Viewing Notes very special. The one thing that really bothers me about this DVD set is that the menu on either disc has a PLAY ALL function. It is probably one of my biggest pet peeves of any DVD release is when there in not an option to play every episode on the disc without having to go back to the menu. I don’t know why they do it but I’ve found this on a few discs and it makes no sense to me at all. I’ve enjoyed watching episodes of this series and listening to the radio episodes. While listening to the radio episodes, it’s fun to think, with a fair amount of confidence, that I am the only person in the US who is listening to these episodes. Like Edwin Apps, I prefer the black & white episodes. There is something about them that just feels right in terms of the subject of the series. The series just looks a little cooler. Who knows? If more episodes existed maybe this would have made it over to the US for PBS viewing or could have seen more reruns in the UK. Unfortunately, this little gem has been sequestered into the realm of the forgotten TV series. That really is a shame. Next week: The first two episodes of a series written by the masters of comedy Galton and Simpson. Truly one of the greatest comedies of all time: Steptoe & Son. The Offer (Comedy Playhouse) and The Bird.